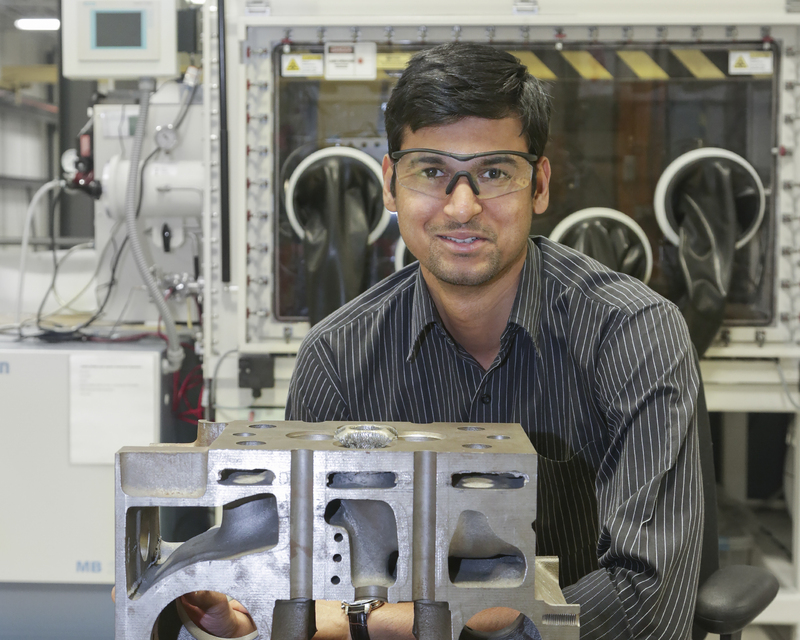 Niyanth Sridharan's research at Oak Ridge National Laboratory has contributed to understanding the unexpected behavior of irradiated alloys. September 13, 2017 – Niyanth Sridharan grew up in a family that indulged his questions by using real-world examples to explain scientific concepts. That natural curiosity still drives the materials researcher today as he explores additive manufacturing techniques at the Department of Energy's Oak Ridge National Laboratory. “Every time my uncles visited they taught me scientific concepts. I never really knew what metallurgy was until my uncles encouraged me to explore it,” Sridharan said. He credits their influence for his desire to pursue a career in engineering. “One of my uncles used to quiz me on simple scientific phenomena like surface tension and used real-world examples. Learning about science through these examples is a great way to kindle interest and spark an emotion that makes problem sets come to life,” he said. While deciding on his doctoral studies, Sridharan recalled his work as an undergraduate at the Indira Gandhi Center for Atomic Research, a national laboratory in India. “My mentor was the head of the welding metallurgy group and he knew Dr. Suresh Babu. I read some of Suresh’s papers and was very interested in the work he was doing at Ohio State University.” Niyanth pursued and received acceptance into Ohio State to earn his graduate degree under Babu’s mentorship. When Babu moved from Ohio State to the University of Tennessee, Knoxville, Sridharan followed and became a student at the Bredesen Center for Interdisciplinary Research and Graduate Education, which encourages entrepreneurship in addition to academics. During that time, he began working as a graduate student at the Department of Energy’s Manufacturing Demonstration Facility (MDF) at ORNL, in the Deposition Science and Technology group. After earning his doctorate in 2016, Sridharan continued his work at the MDF as a postdoctoral researcher. Sridharan’s Ph.D. work revolved around a process known as ultrasonic AM. One of the challenges with the technology is that the sonotrode—the tool used to make vibrations during the ultrasonic AM process—would deform when trying to weld steel. Niyanth proposed coating the sonotrode with a much harder, wear-resistant material using the Direct Metal Deposition System, thereby enabling the ultrasonic system to deposit steels and nickel-based superalloys in addition to aluminum. The project was a success. In another collaboration, Sridharan worked on a lab-directed research and development (LDRD) program to fabricate control plates for the high flux isotope reactor (HFIR) led by Kurt Terrani of the Nuclear Fuel Materials group. “I was very impressed by the way an LDRD project brings people with diverse scientific backgrounds together to work on a problem,” Sridharan said. He helped Terrani and his team fabricate and irradiate alloys for fast reactors to understand material performance under irradiation. Sridharan said he would like to teach one day, following in the footsteps of family who took the time to explain science to him as a child. “I hope to gain as much knowledge as possible from everyone around me so when I am in an academic setting, I can use the bridges I’ve built at ORNL to aid in my research as well as help my students.” ORNL is a great way to have one foot in early-stage applied science and another foot in fundamental research, he added.